Freud – according to his many biographers – was mad about mushrooms. But not just any old fungi. He had a weakness for ceps which he hunted in a peculiarly systematic and organised manner. His family were instructed to spread out and make a minute inspection of the forest floor, like a fingertip search for clues in the aftermath of a dastardly crime. When his eye lighted on a likely specimen, he would utter a whoop of delight, pounce upon his prey, whip off his green felt hunting hat and clamp it firmly over the mushroom. With the other hand he took out of his a pocket a whistle which he would blow energetically. His approach to mushroom-hunting was certainly idiosyncratic, but his passion for ceps (and other fungi) was by no means unique. Throughout Europe in the autumn/fall, mushrooming is a way of life, and walks in the countryside take on an added dimension. From the Balkans to Catalunya (and many points in between), people can be seen bending intently over the forest floor or scouring the meadows, brandishing baskets and pocket knives. 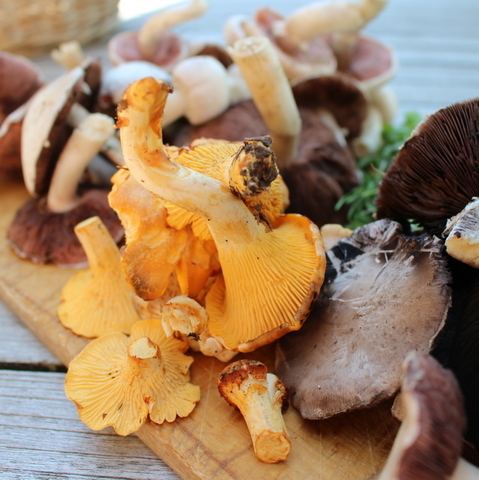 This year in Alsace hasn’t been the best for mushrooms – our summer was way too hot and dry – but I have found plenty of field mushrooms and (this year’s discovery) some fab parasol mushrooms. Thanks to my foodie friend (and fellow forager) Carla Capalbo, who stopped off here en route from Italy to London this week, I tumbled (belatedly) to the wonder of this gorgeous mushroom, dipped in egg, showered with fresh breadcrumbs, fried till crisp and eaten in the fingers with a sprinkling of crunchy salt. Snacks don’t get much better than this. My workshop programme for the autumn has to be set up in June, and this year I scheduled – for the first time – one entitled Fungi Feast. I love foraging, and can always count on a goodly crop of ceps, field mushrooms, chanterelles and horns of plenty. Little did I know that this autumn was going to turn out to be a bit of a dud where mushrooms were concerned. In the event, though I couldn’t supply many home-foraged ones, we found a good mixture to work with – fresh ceps (from Hieber), chanterelles (from Russia…with love? ), a mixed pack of shiitake, oyster mushrooms, the lovely little pioppini that grow beneath poplar trees and chanterelles (from Co-op), plus cultivated champignons de Paris and browncaps to bulk things out…oh and some dried ceps, which are packed with flavour and great for our soup, plus frozen ones (from Picard). After lunch we took off into the forest and found more parasol mushrooms, so honour was restored and [my] foraging reputation slightly salvaged. The dried ceps give this gorgeous autumn soup a meaty, mushroomy kick – be sure to keep the water in which you soak them, as it has loads of flavour. The fresh mushrooms can be ceps too, or mix these with other mushrooms, including cultivated. Soak the dried ceps in 1 cup (250ml) of hot water and leave for about 30 minutes till soft. Drain the ceps, reserving the soaking water. Heat the butter and oil in a large saucepan, cook the onion and garlic gently without allowing them to brown. Add the soaked, drained ceps and fresh mushrooms, season with salt and pepper, cover and stew gently till the juices are rendered (about 5 minutes). Uncover the pan, raise the heat and cook hard, stirring, till juices are concentrated and evaporated. Stir in the flour and cook a little more. Add the stock, milk and reserved cep soaking water, season to taste, add a grating of nutmeg and bring to a boil, stirring. Simmer the soup for 15 minutes – take care it doesn’t boil over! Draw the pan off the heat and blend the soup in the pan with a hand-held blender (or let cool, tip into a blender and blend till smooth). Check the seasoning and adjust if necessary. 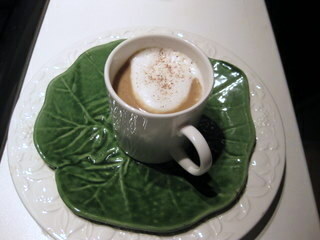 To serve, froth up the milk (if using milk). Ladle the soup into 6 heated bowls or 10-12 little coffee cups and top with frothy milk (or swirl in some cream instead). A cheeky little starter or light lunch dish of stewed ceps (bulk them out with cultivated if ceps are scarce) set on a disc of puff pastry. 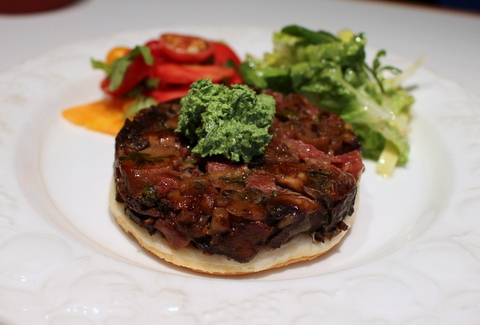 Serve a little salad on the side and top the tatins, if wished, with a blob of pumpkinseed and parsley pesto. Unroll the pastry. Using a baking tin or ramekin as a template, invert the tin/ramekin onto the pastry and cut out 6 pastry discs. Put these in the fridge while you prepare the rest. 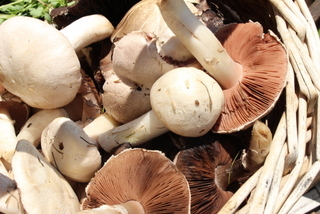 Trim the ceps and/or cultivated mushrooms, rinse and dry them carefully. Separate the caps and the feet and slice both quite thickly. Heat the oil in a large frying pan and fry the spring onions or shallot and garlic over gentle heat till soft but not coloured. Stir in the mushrooms, add salt and pepper to taste, cover the pan and stew them gently till they release their juice. Uncover the pan, raise the heat and cook hard, stirring, to concentrate and evaporate the juices. Stir in the parsley, walnuts and ham, tip out onto a plate and leave to cool. Trace 6 circles the same size as the baking tins or ramekins on some baking parchment and cut out 6 circles. Butter the insides of the ramekins/baking tins and lay the parchment circles in the bottom. Fill the tins/ramekins to the top with mushrooms, pressing down lightly – they should be well filled. Lay a pastry disc on top of each one, tucking it just inside the rim. Snip the tops with scissors and refrigerate till you plan to bake them. Heat the oven to 200C and bake the tartlets for 25-30 minutes or until the pastry is golden and the mushrooms thoroughly hot (ceramic ramekins will take a little longer than tins). 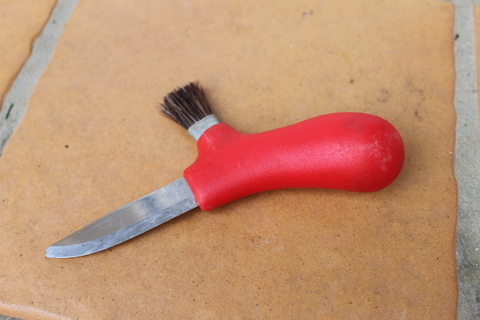 Run a knife around the inside edge, place a plate on top of each one and turn out. Peel off the baking parchment and serve with a little dressed salad. Potimarrons are great for this, as they keep their shape when baked. You can even eat the skin, which makes serving easy: just cut in wedges and serve each wedge cradling a good portion of mushrooms. The dish reheats beautifully: bake the potimarron, make the mushroom ragout and refrigerate them both. Fill the potimarron with the mushrooms and bake at 180C for 25-30 minutes or until hot (or microwave on maximum for 8 – 10 minutes). Scrub the potimarron and slice the top off (reserve for a lid), scrape out the seeds, season inside with salt and pepper and a knob of butter. Replace the lid, wrap in foil and bake for 1-1½ hours or until tender – stick a knife in the lid to test. Trim and rinse the mushrooms and slice or quarter, depending on size. Heat the oil and remaining butter in a frying pan and soften the shallot without allowing it to brown. Add the mushrooms, season with salt and pepper, cover the pan and cook for about 5 minutes till the juices run. Remove the lid and cook hard for another 4-5 minutes till the juices have evaporated. Stir in the crème fraiche, heat till bubbling and allow to reduce a little. Check the seasoning. 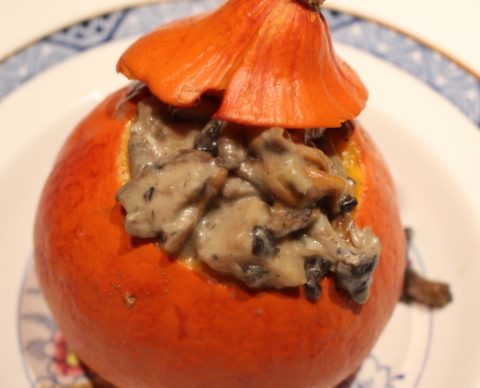 Fill baked potimarron with hot mushrooms. Cut in wedges to serve (the skin is edible too), giving each person a good helping of mushrooms. We just read your post with a lot of enthusiasm — it’s the first time we hear about Freud’s passion for ceps. Such a great thing to think about for next time we go mushroom foraging…! And the good writing makes us want to read one post after another. Both of us also sighed an envious “woooooow” when reading about the parasol fungi dipped in egg and breadcrumbs!!! Thank you for this cleverly written post…although I restrict my mushroom hunting to the wilds of the grocery store, I will enjoy your recipes! Hope yr wild and wonderful grocery store has a good fungi selection to keep you happy!